ALBUQUERQUE, NM.-This Friday night on Showtime Fidel Maldonado Jr. (13-1, 11KOs) of Albuquerque, will be looking to bounceback after a technical knockout loss in his last outing, to avenge another from his amateur days, against Newark prospect, 22-year-old Michael Perez (16-1, 10KOs). The amateur and professional contemporaries will be featured in the co-main event of the Randy Caballero vs Manuel Roman ShoBox: The New Generation undercard at the Fantasy Springs Casino in Indio, California. The two, first squared off in Grand Rapids, Michigan at the 2008 National Golden Gloves tournament. Perez came out with the 5-0 victory and went on to win the 132lb national crown that year. “I had so many people come up to me after the fight telling me that I won,” says 21-year-old Maldonado. Both men share a common opponent in Eric Cruz, former WBC Youth Lightweight Champion; a title Maldonado took from him October of 2011 via unanimous decision. He would then would that go on to lose the same belt by technical knockout to Fernando Carcamo in his first and only defense. In turn, after his second loss since fighting Maldonado, Cruz would go down by a 2nd round techinical knockout to Perez. 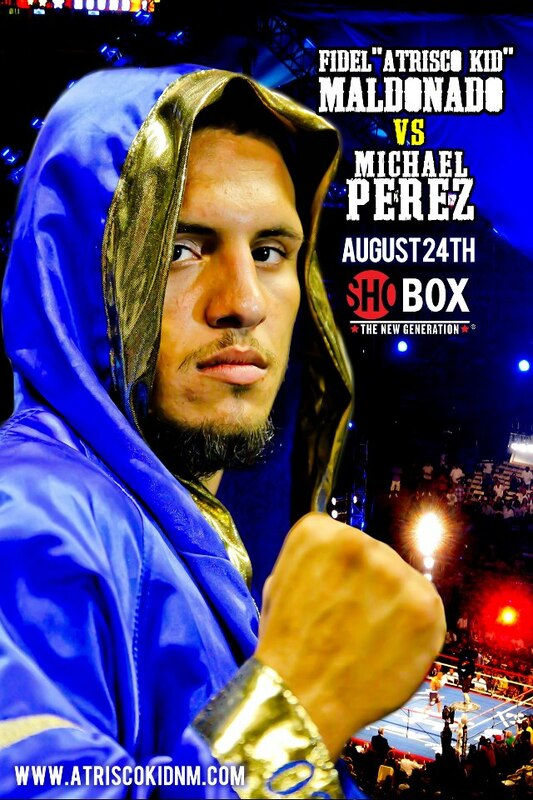 Perez’ only loss was to the 22 year-old Figueroa (19-0, 15KOs), a southpaw like Maldonado. The Albuquerque native hopes to incorporate the same style of boxing that Figueroa was successful with to take down Perez. All three prospects, Maldonado, Perez and Figueroa are all signed with Golden Boy Promotions. It’s quite possible that the winner of the Maldonado-Perez contest will face the tough Omar Figueroa in the near future. Friday’s contest will be the first time Maldonado will appear on Showtime who typically fights on Telefutura. This will be the second time Perez will be appearing on the premium cable network. The action starts at 8:05 Pacific, 9:05 Mountain and 11:05 Eastern times.